Are you waiting for the iOS 12 jailbreak for a long time? Well, there is a piece of good news for those who are eagerly waiting for iOS 12 jailbreak. 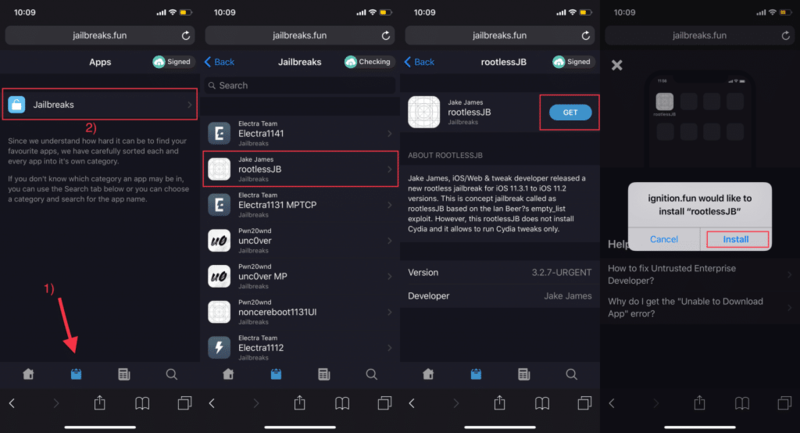 Here’s how to jailbreak iOS 12.0-12.1.1-12.1.2 using RootlessJB by Ian Beer and Bazad. With the release of iOS 12.1.4 last week fixing the Group Face Time bug, Apple stopped signing iOS 12.1.2. but luckily Rootless JB for iOS 12.0-12.1.2 is out now which is good news for jailbreakers. Also if you have already updated your iPhone to the latest version iOS 12.1.4 and wants a jailbreak then you have the chance to downgrade back to iOS 12.1.1 beta 3 and jailbreak it via RootlessJB. RootlessJB supports iPhone and iPad running iOS 12.0-12.1.2 with A9, A10, and A11 devices but sorry to say that the latest A12-based devices such as iPhone XS, XS Max, XR and 2018 iPad Pros are not supported yet. RootlessJB jailbreak will add support for A12 and older A7, A8 and A8X devices soon. Please note that RootlessJB does not support Cydia but it does support tweak injection and SSH as of latest version. Step 1: Simply head on over to jailbreaks.fun on your iPhone or iPad using Safari or any browser. Step 2: Now search for rootlessJB from the search bar. Then tap the Get button and hit the Install and wait for the download to complete. Step 3: Once RootlessJB is installed, go to the Settings app and head on over to General > Device Management and Trust on the China Mobile RootlessJB jailbreak certificate. Step 4: Open the RootlessJB app and toggle on the “Tweaks” and then tap the Jailbreak button. Note: Your iPhone or iPad should be in AirPlane mode. Step 5: Now your device will respring which indicates that your device is successfully jailbroken and after then you can install the tweaks via Tweak Injection and SSH. If your device restarts, then you’ll have to try again. If you have any queries, please let us know in the comments below.